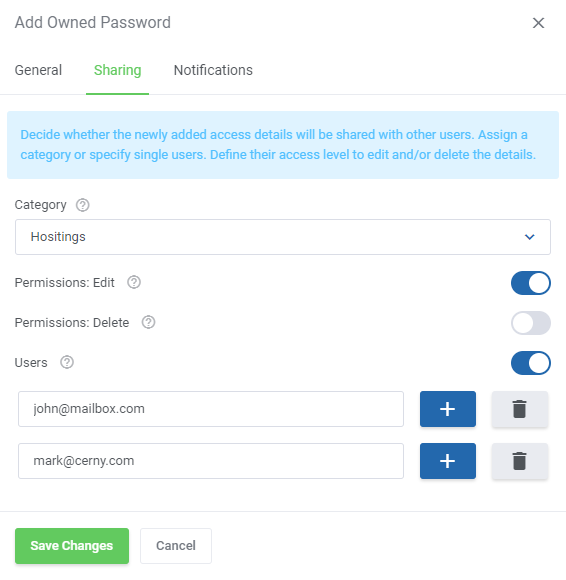 Password Manager For WHMCS gives you the possibility to store passwords and share them safely with your staff and clients. 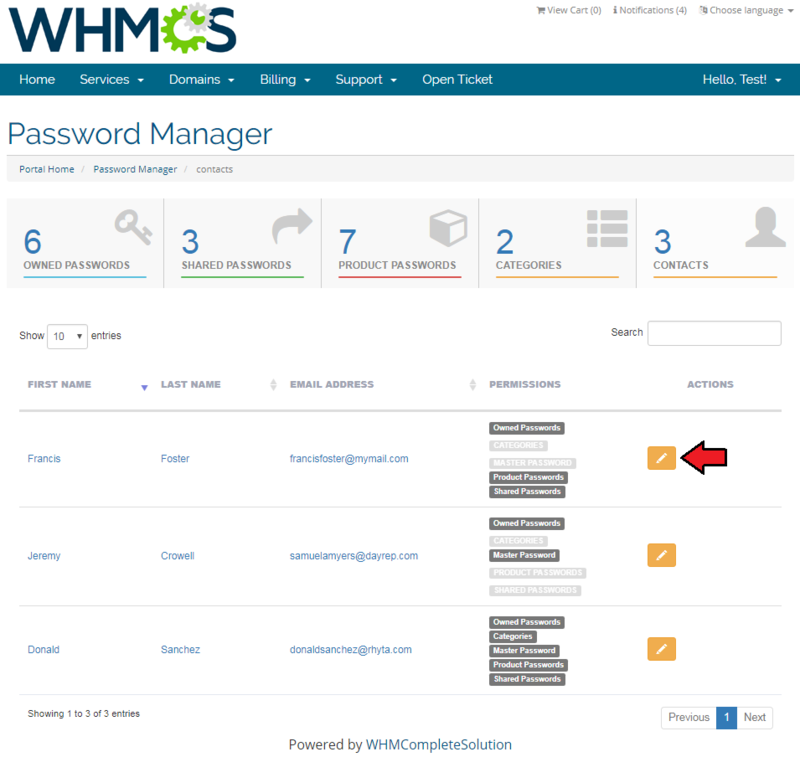 The module offers various mechanisms allowing you to conveniently manage passwords, send email reminders, as well as integrate with your WHMCS client area. 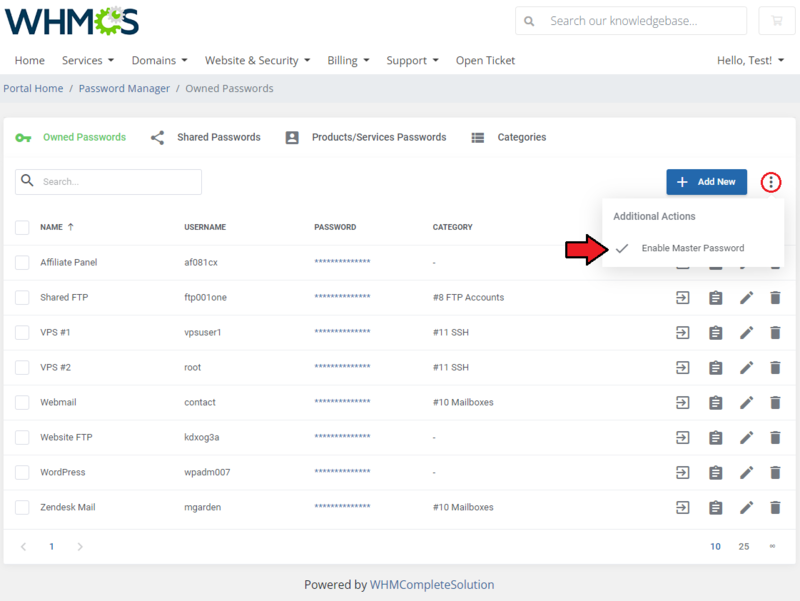 Owing to implementation of advanced two way encryption, Password Manager For WHMCS provides a high security level for your and your customers' valuable data. 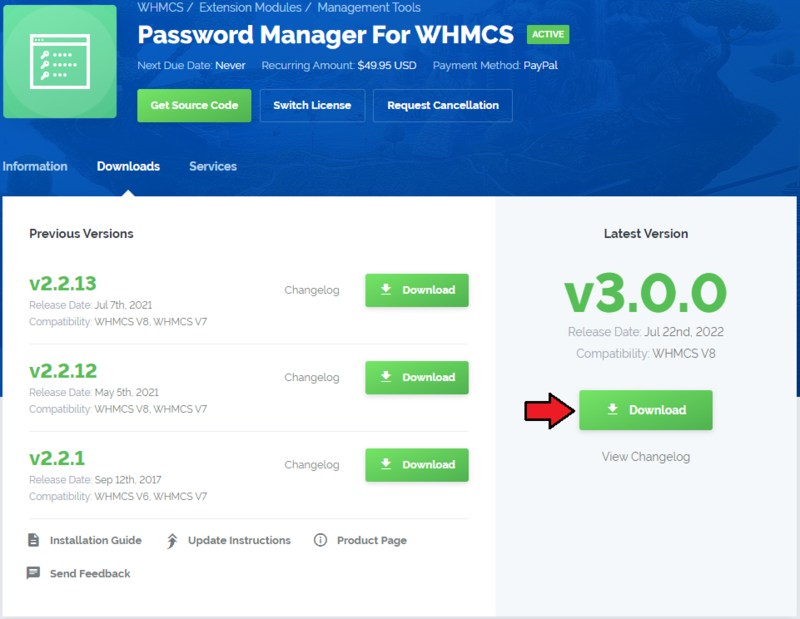 This tutorial will show you how to successfully install Password Manager For WHMCS. 4. 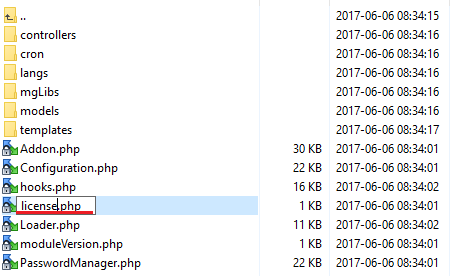 When you install Password Manager For WHMCS for the first time you have to rename 'license_RENAME.php' file. File is located in 'modules/addons/PasswordManager/license_RENAME.php'. Rename it from 'license_RENAME.php' to 'license.php'. 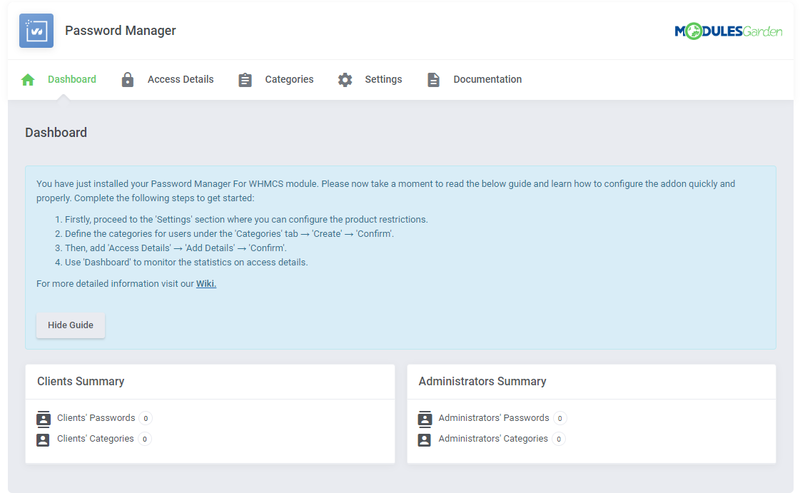 Log in to your WHMCS administrator area. Go to 'Setup' → 'Addon Modules'. Afterwards, find 'Password Manager' and press 'Activate' button. 7. In the next step you need to permit access to the module. 8. 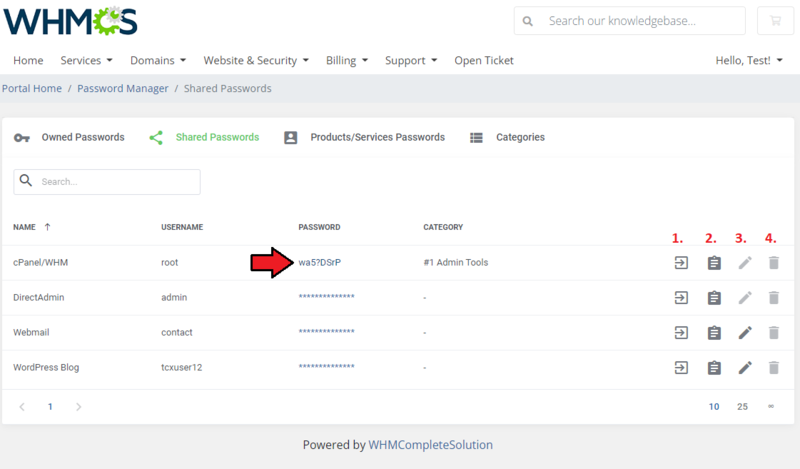 You have just successfully installed Password Manager For WHMCS! 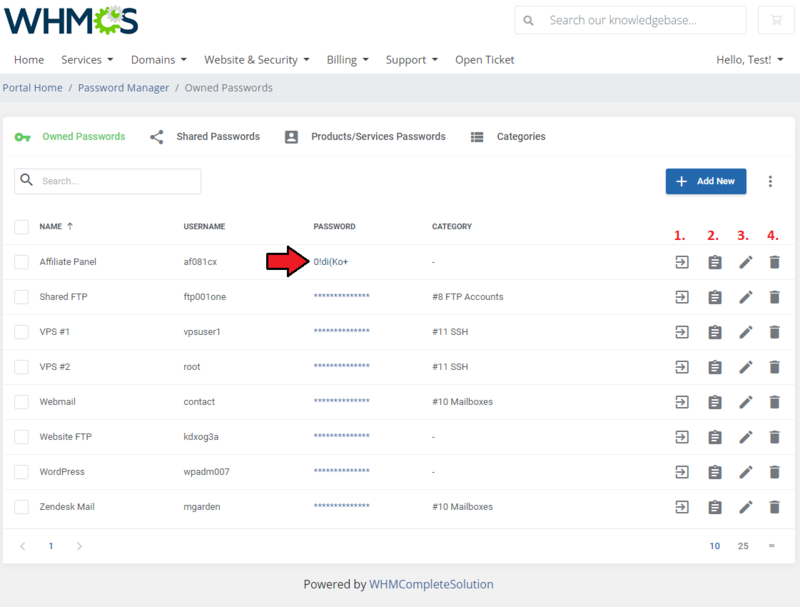 You can access your module under 'Addons' → 'Password Manager'. 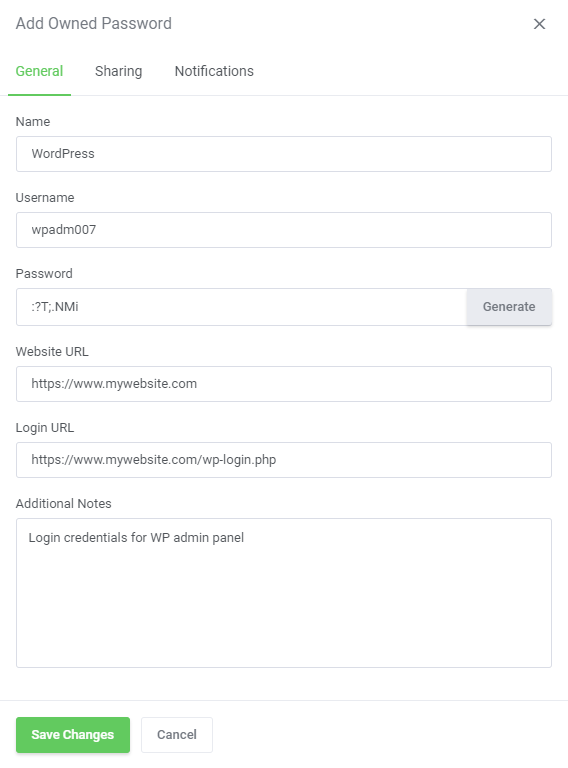 Password Manager For WHMCS allows to share passwords in your WHMCS. passwords, define email notifications and manage security settings. 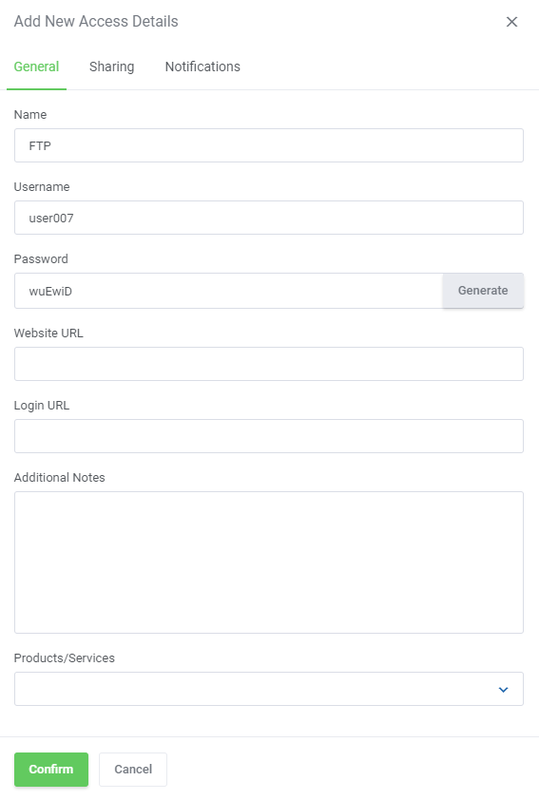 First of all, decide whether you wish to allow to display a full list of client's products and services login details by selecting option: 'Client Product Password'. 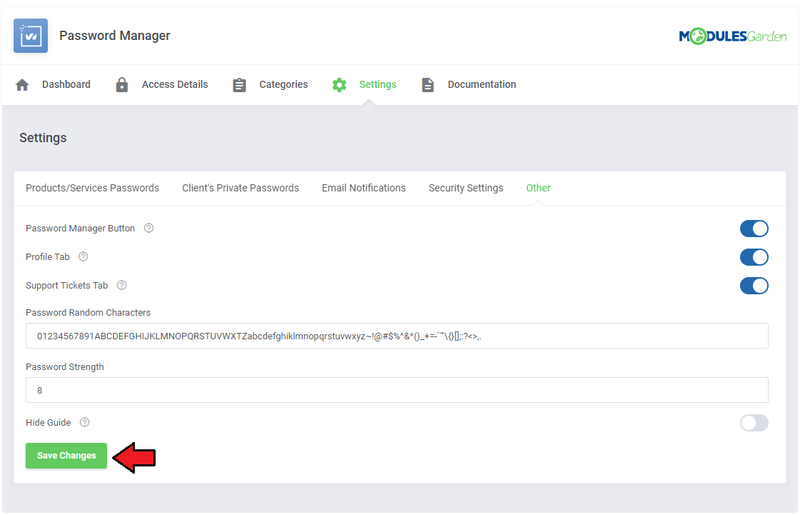 If enabled, access details to client's products and services will be displayed in the client area → 'Password Manager'. 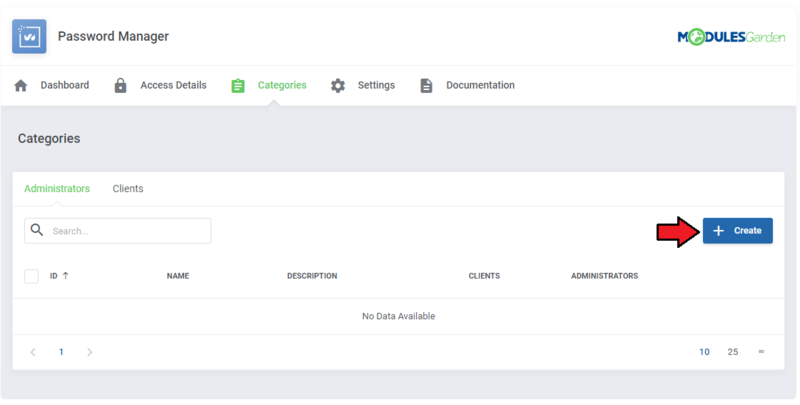 'Exclude Client Groups' - enter any client group name to disable product's access details from being displayed for clients in these groups. 'Exclude Clients' - disable product access details for pointed here clients. 'Exclude Product Groups' - enter any product group names, to which access details will not be shown. 'Exclude Products' - access details for products, which are entered here, will be disabled. The next section is dedicated to the management of private passwords of clients. If you wish to allow your clients to manage their personal access details, select the 'Client Private Passwords' option. 1. 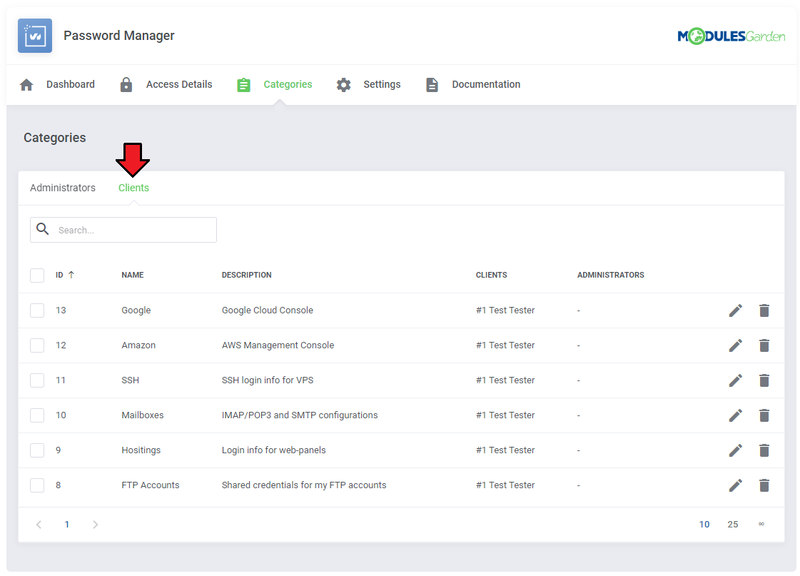 'Exclude Client Groups' - disable private access details management for selected here client groups. 2. 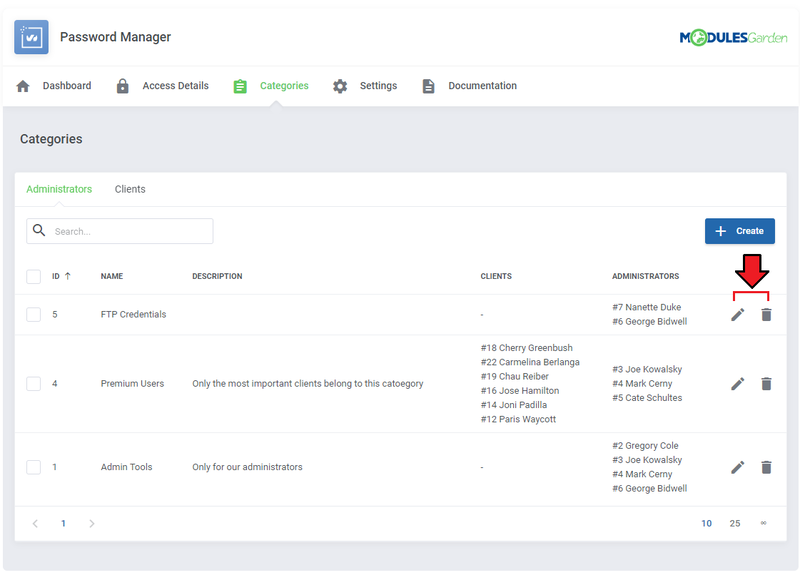 'Exclude Client' - disable management of private access details for pointed here clients. 3. 'Passwords Limit Per User' - set up the limit of private access details for one client. 4. 'Exclude Client From Limit' - enter clients for which the set up above limit will not be effective. This section allows you to define email notification templates that will be sent by the module on specific actions to clients and administrators. 1. 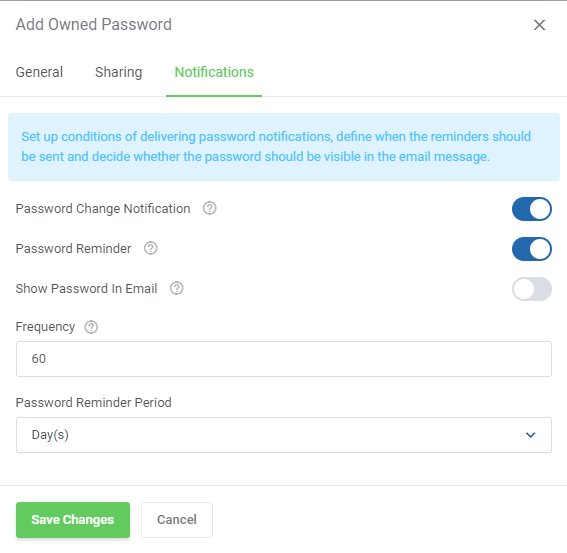 'Password Change Reminder' - select an email template that will be used to remind clients or administrators about the need to change the password. 2. 'Password Change Notification' - select an email template that will be used to notify clients and about a password being changed. Please note that you have to select templates for clients and administrators separately. If you want to disable any of the notification, simply select 'Unassign' from dropdown menu. 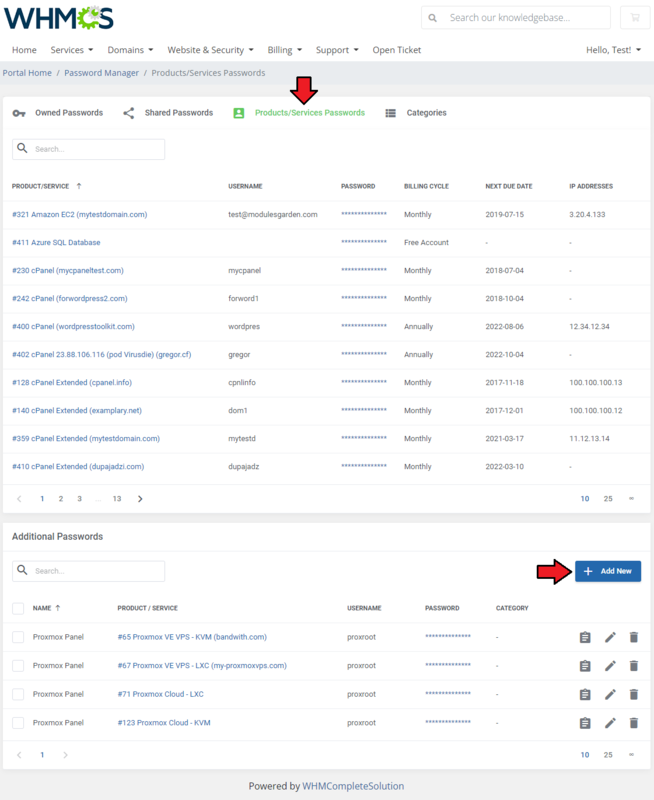 Under 'Security Settings' tab, you have to define the level of access to clients' passwords for administrators and grant them extended permissions. Shared access - only passwords marked as 'Shared' will be visible for chosen administrator roles. You may also select here administrators group which will be granted 'Extended Permissions'. It means that administrators from this group will be allowed to view clients access details when 'Visibility For Administrators:' is checked. 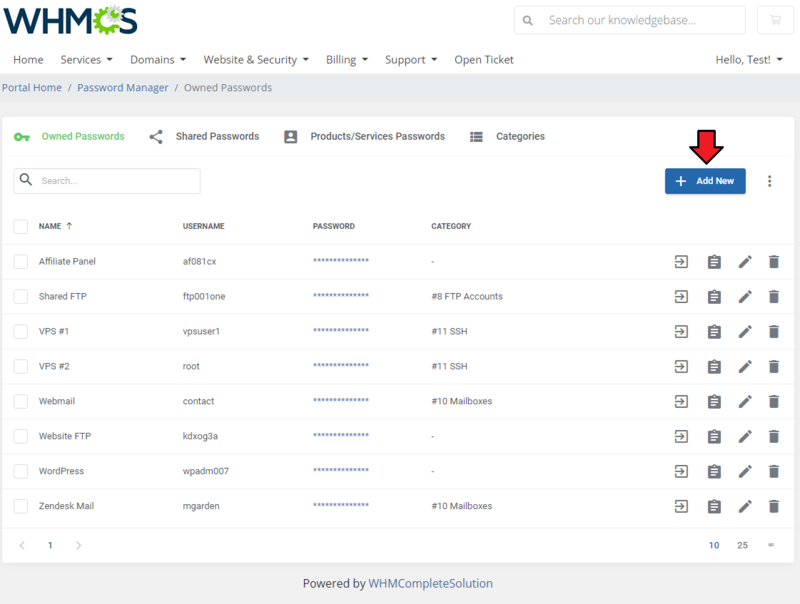 In the very last section you may manage additional options that 'Password Manager For WHMCS ' has to offer. 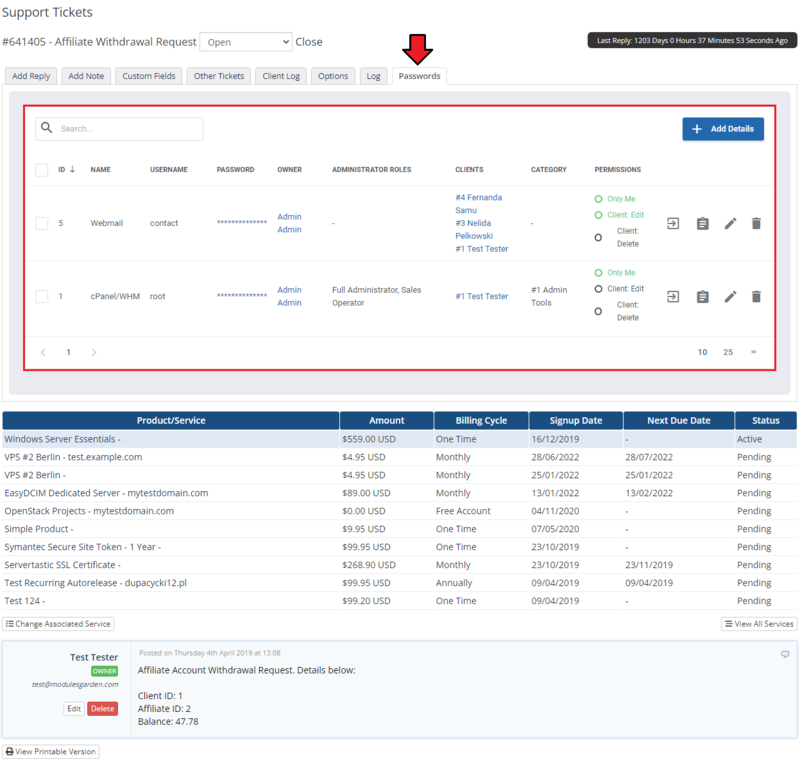 Support Tickets Tab - if you select this option, Passwords' tab will be available on the support tickets site. Do not forget to save the changes when you finish the settings configuration. 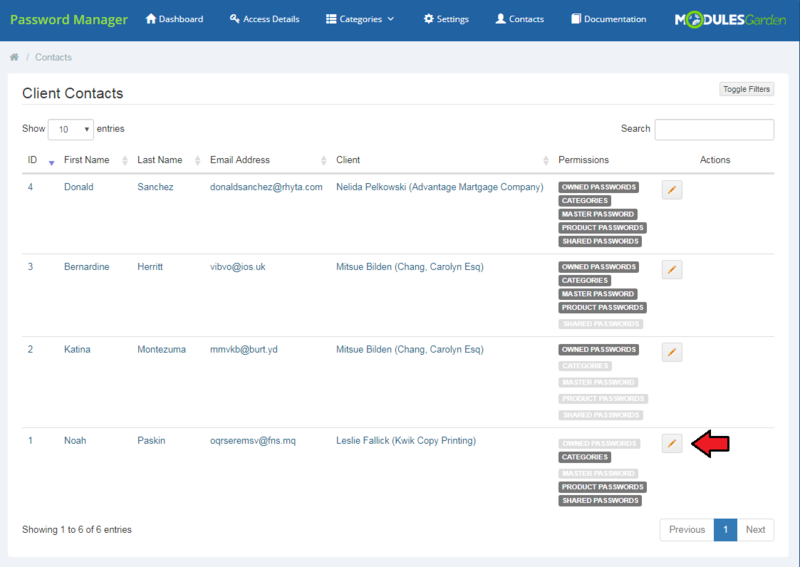 Categories allow you to prepare predefined sets of clients and administrators. Through assigning a category to a password, clients and administrators from that category are granted the permission to view this password. 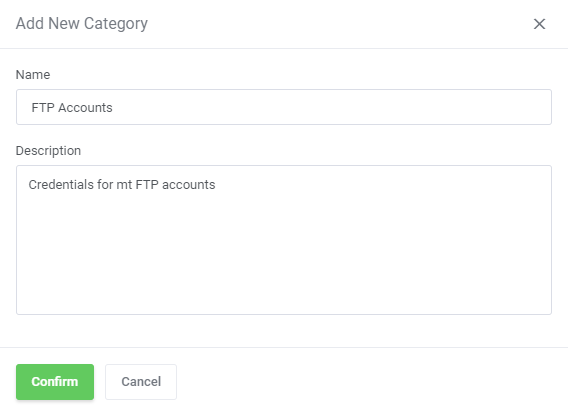 Move to 'Categories' → 'Administrator Categories' where you can add new sets, press 'Add Category' to begin. Now, fill out the form with category name and description. 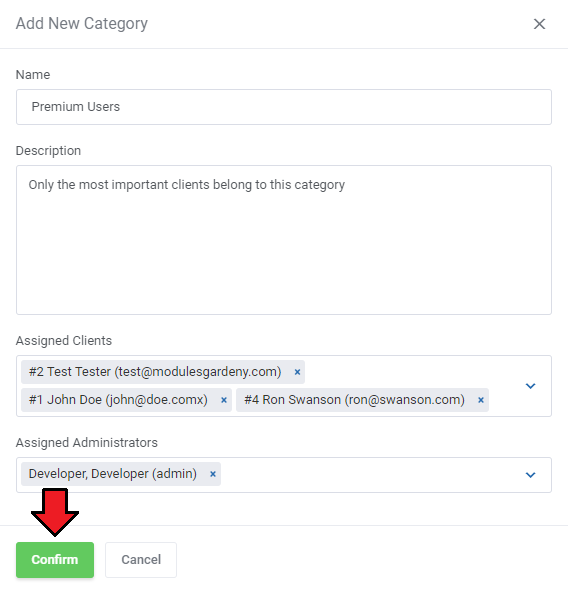 Assign desired clients and administrators to the category and press 'Add'. 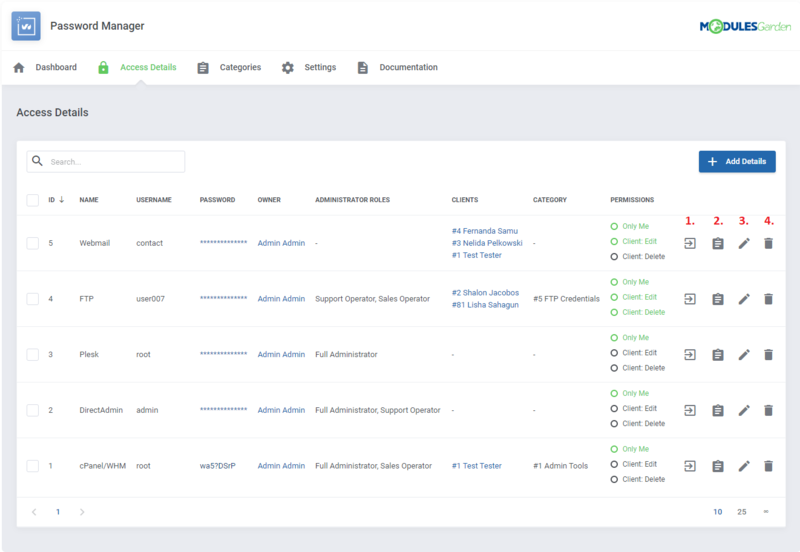 The list of administrator categories with any details such as the number of clients in it and administrators allowed to access the details is now visible. You may always edit the category or delete if needed. Use the action buttons to do so. 'Access Details' section includes a list of provided access details. Here you can create new access details and decide who can view them. Fill in 'Name', enter access details into 'Username' and 'Password'. You can also make your logging in easier through entering website URL and website log in URL consecutively into 'Website URL' and 'Log In URL'. To leave a note associated with access details you are creating, type it into 'Note' textbox. Move to 'Sharing' part to continue. In this section choose 'Category' and select 'Administrators', 'Administrator Groups' and 'Clients' who should have access to this details. Note: There is disjunction relation between 'Administrators' and 'Administrator Roles'. 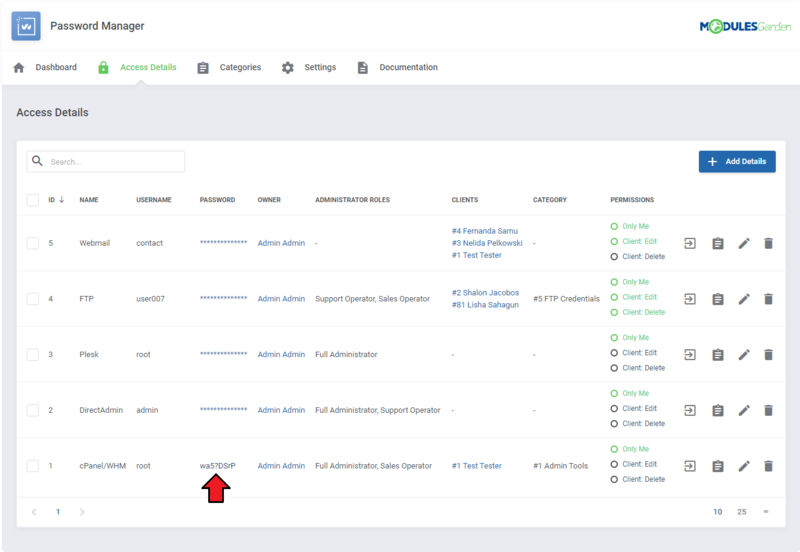 For example, if you assign administrators X and Z and administrator role Y in which administrator X is, then all administrators assigned to group Y will see these access details together with administrator Z. Here, you may also allow clients to edit or delete these details, simple mark 'Permissions' checkbox. 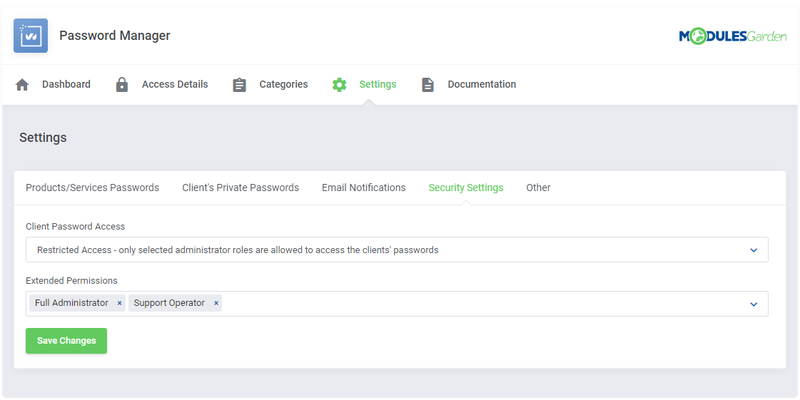 'Permissions' allows you to define clients/administrators/category members privileges. Note: If you leave 'Clients' checkbox unmarked, your client will not see these access details even if they are chosen in 'Clients' option. When ready, proceed to 'Notifications' section. Finally, you can set up notifications rules. 'Send Password Change Notification' - message is sent upon password being changed. 'Password Reminder' - a notification is sent to remind about the necessity to change the password for security reasons. You can inject passwords into each of them through marking adequate checkboxes. Press 'Add' button to finish the process and confirm creation of access details. On the list of access details you will see some basic info, such as ID and name, username and password with the possibility to view the password. (press the category to see who exactly is in it). Finally, you can check set up edit permissions. 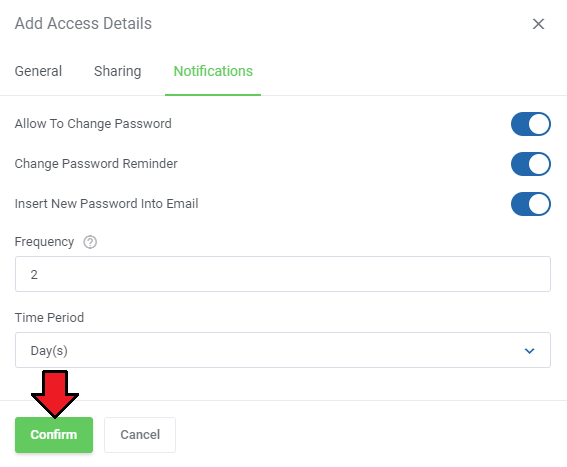 Use action buttons to manage the entered access details. 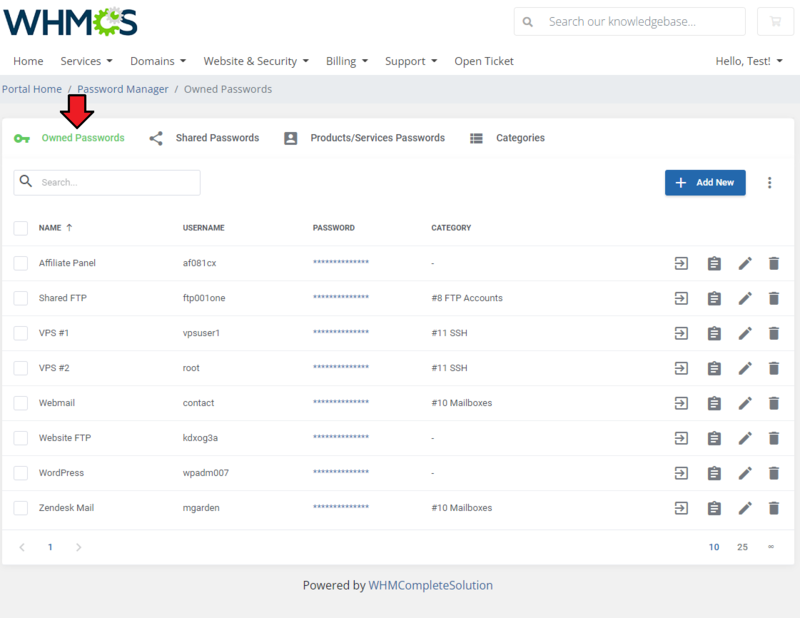 In 'Contacts' , you can see and manage the permissions of clients' contacts/sub-accounts with regard to the access they shall have to the clients' passwords. If you want to change any permission, simply click the 'Edit' action. 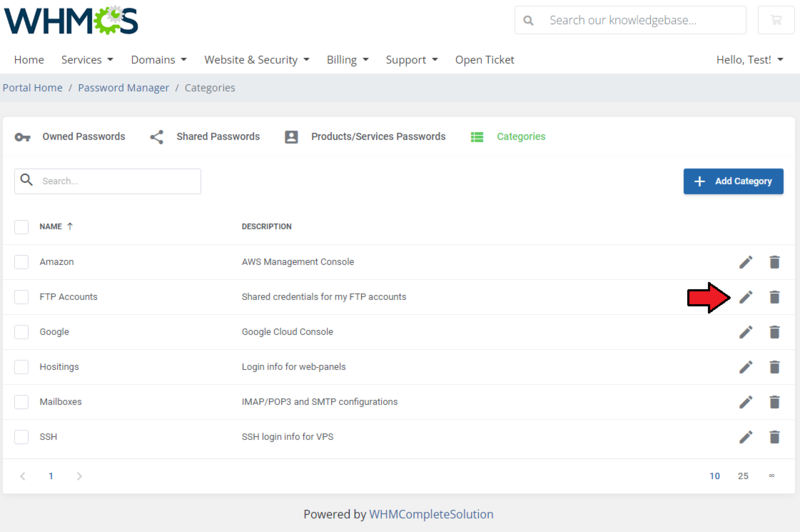 A short summary on the clients' and administrators' access details and categories is available on the dashboard. The last tab in the addon is 'Documentation'. When pressed, it redirects you to this very site. 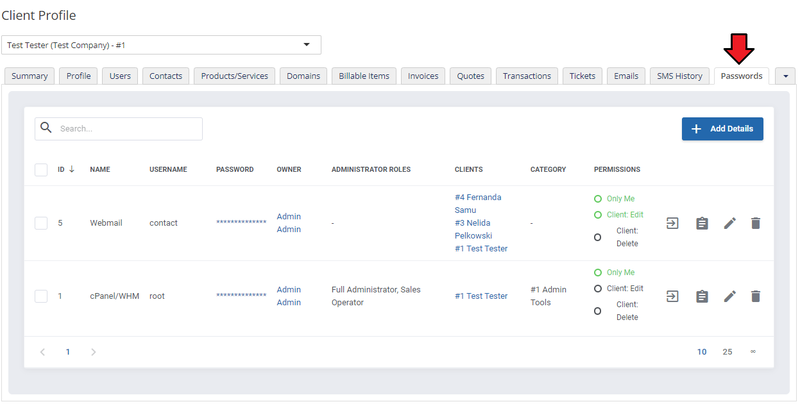 Our module integrates with your administrator area as well as client area. Passwords of any client can be viewed in summary page as it is shown below, but only if you enable this option in 'Settings' section in the addon. You may add new passwords directly from this site, simply press 'Add New' and you will be moved to the 'New Access Details' form. 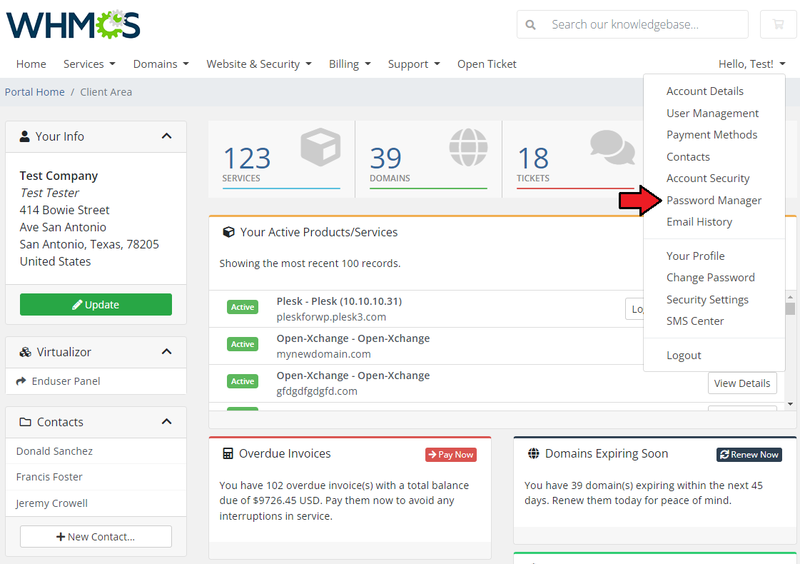 Your support operators are also able to access clients passwords from within ticket. As you may have noticed, these places allow them not only to see passwords, but also create new ones. Note: this tab is available only if option has been enabled in the addon. 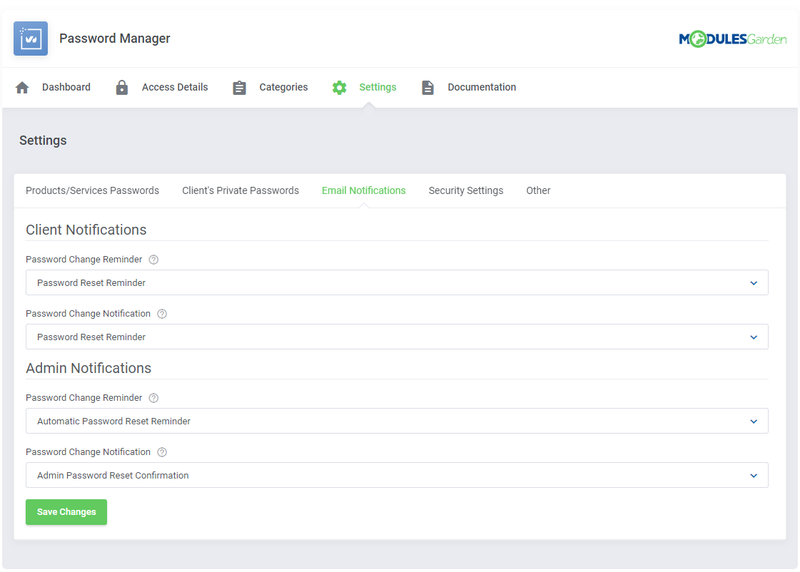 Your clients can access client area password management page through 'Password Manager' button in navigation bar. To allow integration with client area, a proper option must be enabled in 'Addon' → 'Settings' → 'Other'. 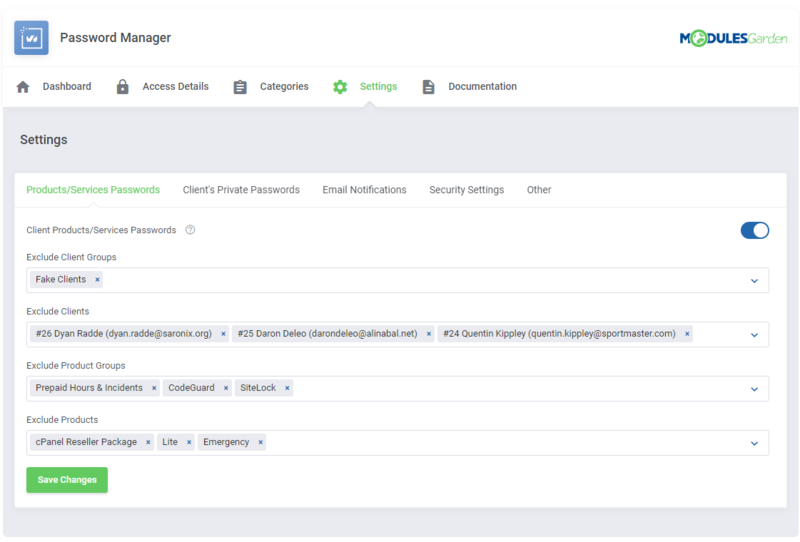 In 'Password Manager', your clients can view access details depending on the settings configured by the administrator and level of access allowed for the client. Underneath you can see a client's area with full access to any option given. As you can see, there are five sections available: 'Owned Passwords', 'Shared Passwords', 'Product Passwords' , 'Categories' and 'Contacts'. If you enabled 'Client Private Passwords' your clients will be allowed to view, manage and create their own access details. Please note that 'Shared' column with information on whether the details are allowed for administrators or not is available only if you select 'Shared Access' in the addon's settings. To create access details, press 'Add New' button as shown on the following screen. Type the new password name and enter access details into 'Username' and 'Password'. You can also generate random password. Optionally, provide 'Website URL' and 'Log In' URL to be allowed to log into your site directly from 'Password Manager' page. Leave a note if you need. You may now move to 'Sharing' section. There, you can decide which category the new access details will be assigned to. Choose one from the dropdown menu or select 'Unassign' to leave it without any category. Depending on the category you select, the access details will be available for those specified in its configuration. Additionally, define which actions can be made on shared passwords. Moreover, you can specify custom email addresses to share your credentials with other customers. Finally, in ' Notifications' section, set up conditions of delivering password notifications. Enable this option if needed and define when the reminders should be sent. You can also define whether you wish to receive the new password in the message. Do not forget to press 'Add' to finish. 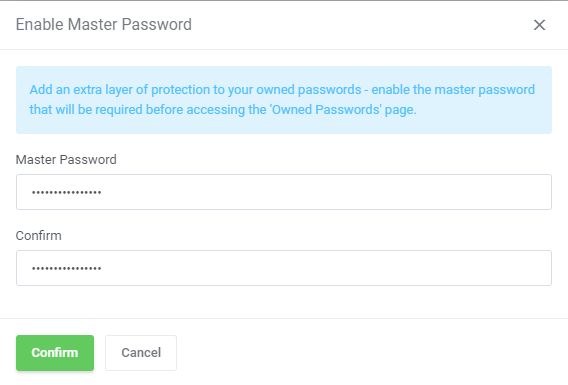 If the administrator has enabled the 'Master Password' option in 'Client Private Passwords' , the clients will have the ability to set an additional protection for their owned passwords. Simply provide and confirm a new password that will protect the access to owned passwords. Note - if you lose or forget this password, you will also lose the access to your saved credentials in this section! From now on, access to the 'Owned Passwords' section will require the master password. 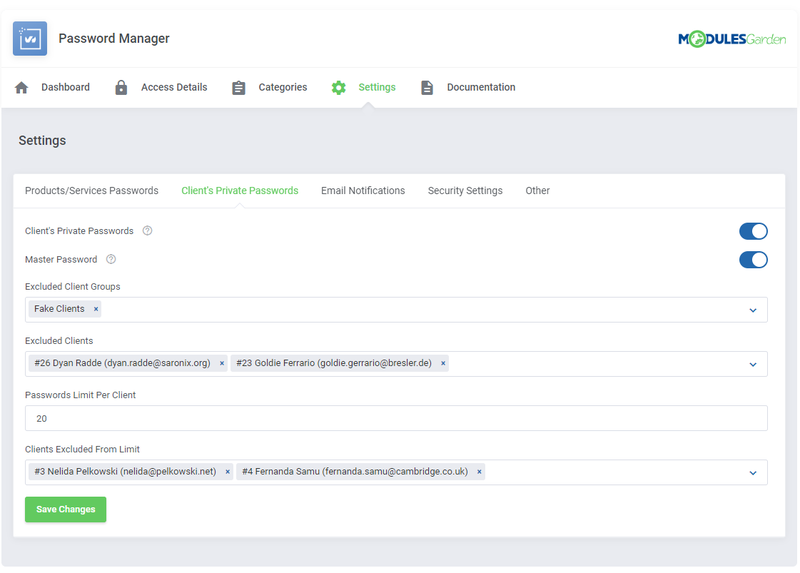 Under 'Shared Passwords' your clients can view and manage access details that administrators shared with them, gave permission to view. 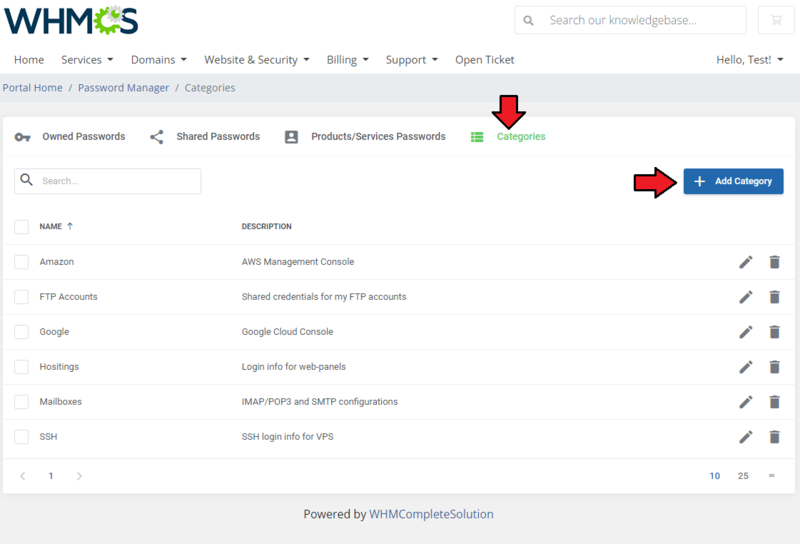 'Product Passwords' section includes any access details to your client's products that they own. For convenience, clients can also assign additional passwords to selected services similarly like in 'Owned Passwords' section. Remember that as an administrator, you have to enable this option in the 'Addon' → 'Settings'→ 'Client Product Password'. Move to 'Categories' tab. There is a list of created by the client categories which are used to allocate passwords for sharing. To create a new one, press 'Add Category' button. Fill in category name and description and press 'Add'. Created category can be seen by this client as well as administrators in the administrator area. Clients may edit their categories, delete and add new ones any time they wish. 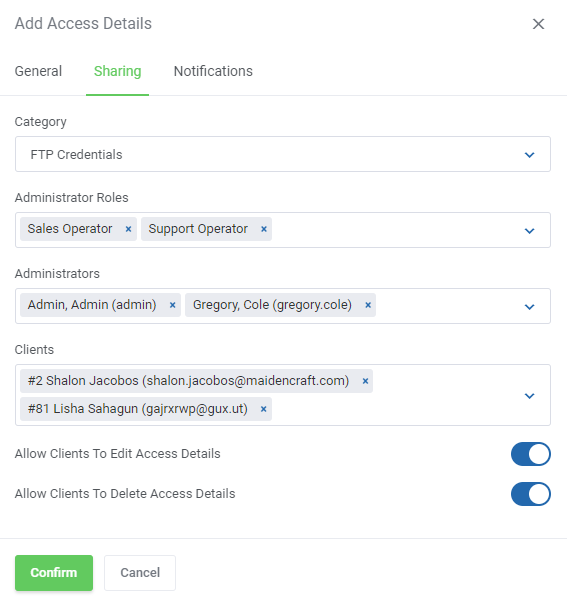 Any categories created by clients will be automatically visible for administrators in the addon where you can manage them. If the clients have contacts/sub accounts, their access can be restricted to the selected sections of Password Manager. To proceed, just select the contact and press Edit. In the opened window, select which sections chosen contacts may have access to. 1. Any additional options under 'Addons' → 'Passwords Manager' → 'Settings' → 'Other' are by default enabled on the module activation. If you change any of these settings you will loose access to some of the module's functionalities. 2. 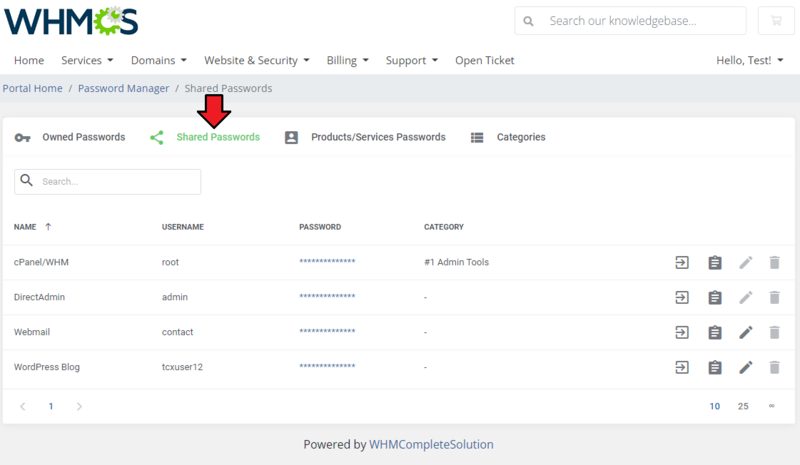 Password Manager For WHMCS ensures full protection of your access details using its own security tools and WHMCS internal two way encryption system. Note: custom encryption key is stored in 'configuration.php' file. This page was last modified on 18 March 2019, at 15:52.